Author: Penou-Achille Somé. Series edited by: Wilhelm J.G. Möhlig, Bernd Heine. 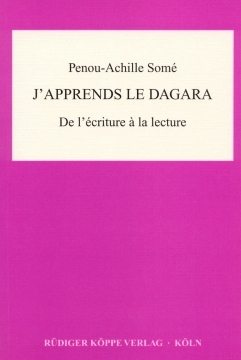 This book on Dagara, a Gur language spoken in Burkina Faso, consists of two parts: an orthographical part, which includes a description of the language’s sounds and tones, and a language course. After presenting the vowel and consonant sounds as well as the tones of the Dagara language system on a phonetic level, the author contrasts the written with the spoken Dagara and gives a detailed description of the pronunciation of letters in different linguistic environments, for which he deduces phonological and morphological rules. The author’s objective is to introduce a new writing system for Dagara which has the advantages of being relatively simple on the one hand – without misrepresenting the structure of the language – and on the other hand being economical in avoiding unnecessary multiplying of diacritic symbols and signs. The result is a writing system which is attractive in its linearity. In the second part of the book the presented rules of the writing system are used as a basis for a series of nine language lessons which serve as material for a guided study of Dagara. Each lesson considers both a specific aspect of the language and an area of Dagara culture, as for example family, socializing, friendship, and the marketplace. The lessons are designed for francophone foreigners, such as NGO-workers in direct contact with the Dagara population, members of the academic community researching the language, and also those Dagara who would like to improve their systematic knowledge of the language.